Addressing a news briefing, he said it had become an issue to maintain the discipline at the university education due to the intervention of the political groups whose aspiration was to create political turmoil. “There are groups who fund in millions for these university students to organize their protest march. 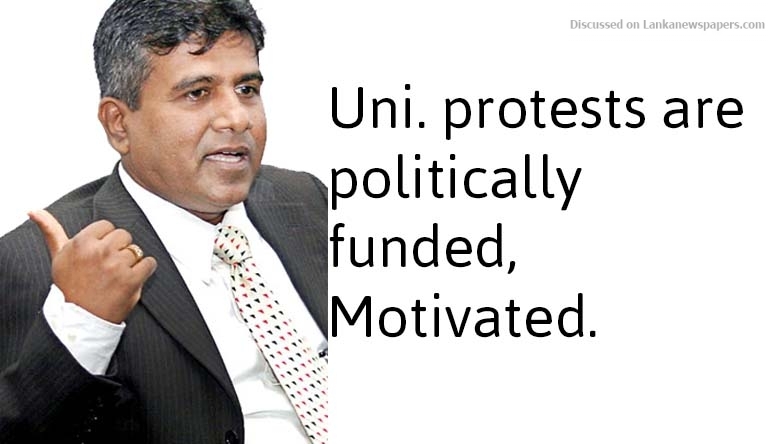 Majority of the students who are involved in these protest campaigns, are not university students,” Minister Rajapakshe said. He said much of the protest marches are not carried out with pure intention to meet out justice but to fulfill political aspirations. Meanwhile, he said the ragging had become a major issue in the universities where a lot of students had been inconvenienced owing to physical and sexual harassment. “We are to carry out stringent actions on ragging in line with the Ragging Act,” he said. He said a phone line 011-212 3700 is available 24 hours to lodge complaints in relation to ragging incidents.